Ms. Ritu Pathak, is the founder Principal of G.D. Goenka Public School, Rohini, New Delhi. With 30 years of holistic experience in developing productive, student-focused environments that maximize the learning experiences, she is committed to highest personal and professional standards as an academician and possesses exemplary management and organizational skills. Heralding an educational paradigm based on innovation, experiment and research, she initiated and established various reputed CBSE institutions including a residential school with pronounced decision-making, policy direction and curriculum planning. 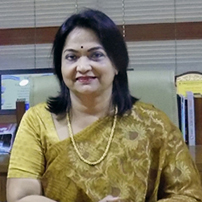 She has served as the Centre Superintendent during CBSE examinations like CTET, JEE Main (AIEEE) and AIPMT (NEET), and functioned as the Chief Nodal Supervisor during CBSE Spot Evaluation for History (Class XII) and Social Science (Class X) She pioneered the school to become the proud recipient of British Council’s prestigious International School Award, and has been a participant of the first Indian Principal’s Conference held at The United Kingdom, selected on the basis of the school’s performance. She is an alumna of La Martinere Girls College and Isabella Thoburn College, Lucknow. She obtained her Management Diploma in Educational Planning and Administration from Amity Institute of Education, and a Post-Graduate degree in History from Aligarh Muslim University.